MORE than £3,500 was raised for Christ Church Infant and Junior Schools at a successful summer fair. The event was organised by the Friends of Christ Church Schools and well supported by parents and by the community. Performances by choirs from both schools were a highlight of the fair, which included a vast range of stalls such as tombola, lucky dip, obstacle course, face painting, fancy dress parade, badge making and craft. A new attraction this year, which proved popular, was henna hand painting. 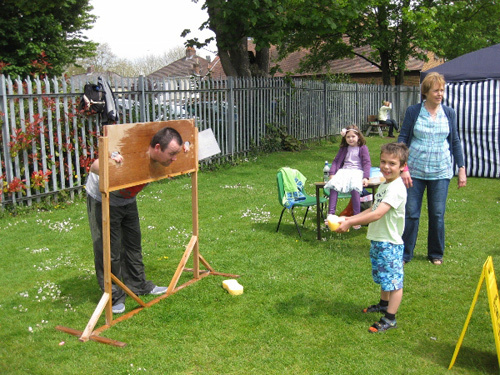 The children's favourite, as always, was the stocks, otherwise known as soak a teacher, when they had the chance to throw wet sponges at head teacher Mr Wilkinson and deputy head Mr Moran. Mrs Poole, a teaching assistant at the infants' school who runs an after-school gardening club, ran a plant stall selling plants grown by the club members as well as donated plants from parents. Mum Karen Davis gave a demonstration of Zumbatonic, Zumba for children, teaching them routines to perform and keeping them active, which she plans to run as an after-school club at the infants' school. Cakes made and donated by children and parents were on sale, as well as teas, coffees, rolls, fresh fruit and ice cream – and there was a barbecue. A display of five classic motorbikes – the oldest from 1929 – was provided by parents Helen and Paul Woodward and the police brought along a patrol car. Louise Lightfoot, chairwoman of the friends' group, thanked all businesses who supported the event with raffle prizes and in other ways. “ We had a fantastic day in the sunshine and it was lovely to see lots of the local community at the fair. The Friends of Christ Church Schools would like to say a massive 'Thank You' to everyone who visited the fair on the day and to everyone who helped organise the fair and helped out on the day.” she said. The money raised will be used on much needed equipment for the two schools.